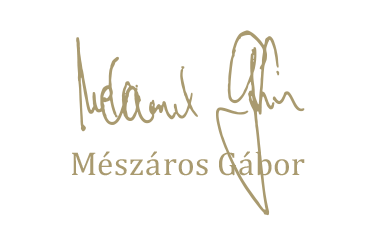 Gábor Mészáros, the founder and owner of the chocoMe manufacture is extremely devoted to the highest standards and quality. 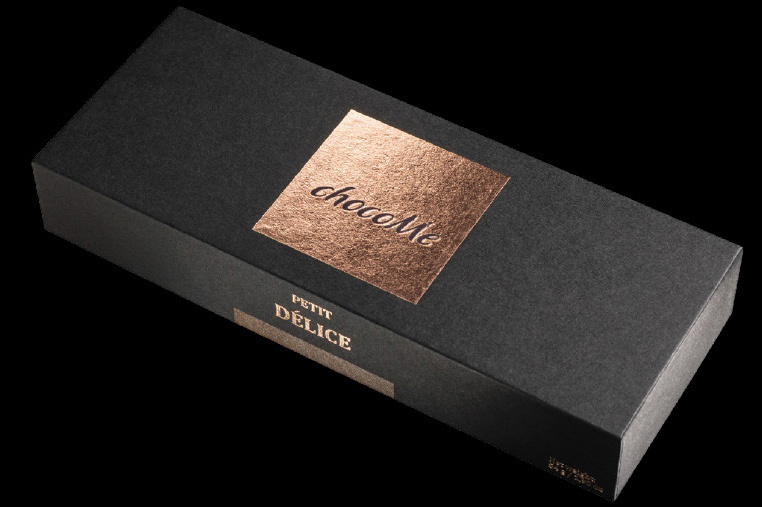 It was his idea to create his very own, custom dark chocolate recipe to position it as the flagship of chocoMe. 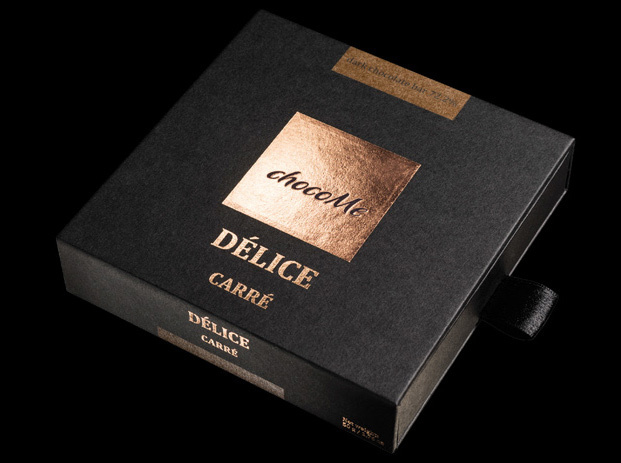 La dragée de la dernière recette chocolat noir de chocoMe, pour laquelle nous utilisons l'une des meilleures amandes au monde, l'amande Fascionello d'Avola. Situé dans la partie la plus méridionale de la Sicile, cette amande sensationnelle a mis le village d'Avola sur la carte du monde de la gastronomie. En raison des 2600 heures d'ensoleillement, du climat balnéaire et du riche sol riche en calcium, les amandes Fascionello ont un aspect distinctement plat, avec un craquement et un goût hors de ce monde. Les dragées finies sont roulées dans de la poudre de cacao provenant de fèves de cacao péruviennes cueillies à la main dans la plantation. 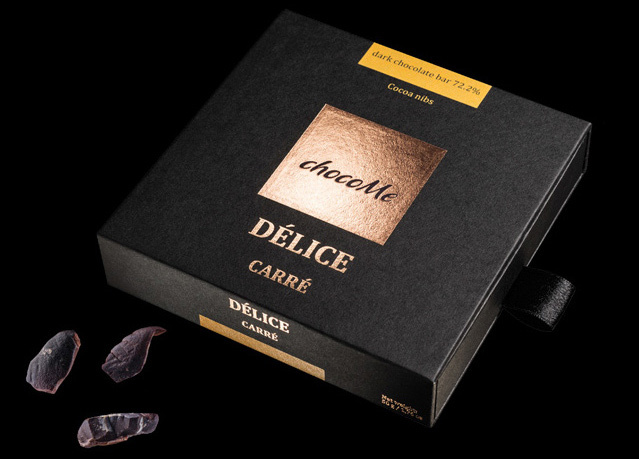 La dernière recette de chocolat noir exclusive de chocoMe sous la forme de barres de chocolat individuelle ou sous forme de coffret cadeau de 12 pièces. 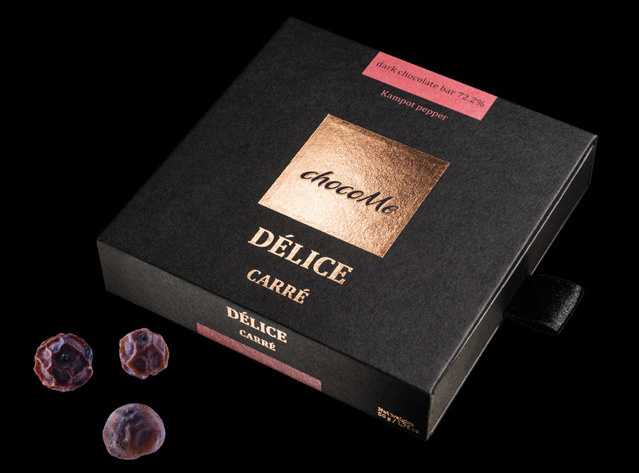 La saveur du chocolat combine un caractère de cacao persuasif, mais non intrusif, avec des notes de tarte dominantes, une forte nuance de fruits rouges, et un arrière-goût persistant. Les flocons de sel Murray River australiens montrent ses cristaux comme une décoration scintillante sur la surface de la barre de chocolat. Chaque bouchée est une surprise pétillante: les flocons de sel fondent et s'unissent en parfaite harmonie avec le chocolat noir. Un vrai chocolat connaisseur cette création faite avec du poivre bien connu de Kampot. Les notes fruitées fortes typiques du vin rouge sont en harmonie inégalée avec les forts arômes de fruité rouge du chocolat noir. Redécouvert au début des années 2000 le meilleur type de poivre au monde sont le poivre récolté à la main de Kampot (Cambodge). Grâce à sa saveur extrêmement chaude bien connue, il a de fortes notes fruitées et une forte finale épicée. Une barre de chocolat pour ceux qui ne sont satisfaits que lorsqu'ils peuvent se faire plaisir avec une forte saveur de cacao dominante. L'intensité des fèves de cacao rencontrent l'arôme de la torréfaction - ce rendez.vous promet une véritable aventure gastronomique. I have created my very own custom dark chocolate recipe in a tiny but uncompromisingly professional chocolate laboratory nearby Paris, France. After sourcing, tasting, identifying the best cocoa origins from around the world, I have fine tuned the aromatic profile for my own dark chocolate, which will create an unforgettable memory for You when tasting a chocoMe Délice chocolate. But how did it all started…? As I started to make chocolate in 2009, I made the decision to understand how professional chocolate is made from the very beginning. And the first steps are obviously the cocoa plantations. I wanted to understand how to grow the best cocoa. That is the reason how I visited some of the best cocoa plantations recently, mostly in the Caribbean region because cocoa origins from this surrounding, Middle America. The cultivation countries are located nearby the Tropical Belt, between Tropic of Cancer the Tropic of Capricorn. Basically, there are three, or some say four different cocoa varieties. 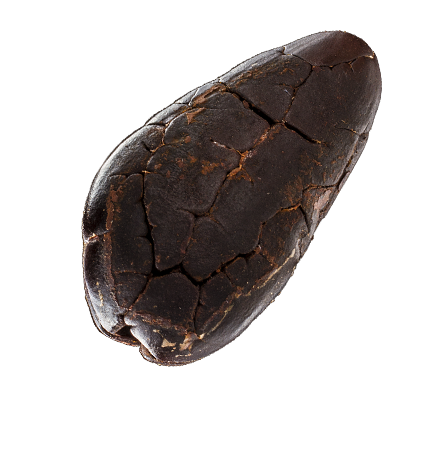 Criollo yields extremely rare cacao with exceptional flavour, it is from Middle and South America. The most popular and robust variety is the Forastero, it is widely cultivated in Africa and South America. Trinitario is a crossbreed between the sensitive Criollo and robust Forastero. Nacional is a really unique cocoa variety which origins and only can be found in Ecuador in a small quantity. With the aim of deep-rooted understanding of the source and origins I needed to know how to unlock the sensorial richness of the cocoa bean. The best idea was to look up the farmers, the experts of cocoa and acquire a lot of knowledge from them. One of the most exciting adventure has begun in my life. Most people have no any idea how to imagine a cocoa plantation. The plantation itself sounds like a systematically cultivated area with endless rows of trimmed trees. This may be the case particularly in Africa, where quantity is more important than quality, but not at the regions where we sourced the best beans for my very own chocolate recipe. These plantations are located in the pure rainforest. Cocoa needs ideal climate conditions, which means constant warm temperatures with high humidity and a lot of rain. Albeit cocoa likes warm weather conditions, it does not tolerate too much wind and direct sunlight. That is the reason why cocoa plantations hide beneath a lot of different, much higher trees like palm trees, banana, and other tropical fruits. During my tour I became acquinted with plants and fruits that I have never seen before. Cocoa trees grow indeed fast, the first crops come after just 5-6 years. Cocoa flowers and the fruits grow directly on the trunk and on the main branches. Cocoa grows all year round and usually there are two harvesting periods. The cocoa fruit can be found in different stages of growth at the same time on the same tree: from the full bloom and the wee fruit, all the way to the ripe fruit. Farmers can harvest the fruit with a special tool, which is a rod with a sharp hook at the tip. After opening the cocoa pod, we can find about 30-40 beans in a white, slippery, wet pulp. There is a great taste of the pulp around the beans, it has some fruity, slightly sour flavour with some sweetness. I wish all the people could taste who love the chocolate! After cocoa beans are removed from the pod, undamaged beans have to be selected one by one and fermentation process starts, which is one of the most important step to allow the cocoa beans to develop its flavours. Cocoa beans are put in wooden crates and are covered with banana leaves and are left to ferment. Once the fermentation process is over, the beans are dried under direct sunlight, they have to be rotated continuously in order to reach homogeneous low humidity. Local farmers have a really unique and traditional method for this matter. As sudden tropical rain could damage the drying beans, drying usually takes place on rollable wooden boards, which can be easily moved under a roof. After this process cocoa beans are collected from the farmers and are controlled on quality. As cocoa beans arrived at the manufacturing facility, cleaned beans are being roasted. This process has an essential influence on the development of the aroma. Each cocoa varieties need individual roasting temperature and time. After a cooling down stage the cocoa beans are put in a blender machine where the pieces are separated from the skin with the help of an air stream system. The cocoa nibs are then being refined. During the grinding process due to heating, the cocoa butter melts and forms a brown mass, which is called cocoa liquor or cocoa mass. At this grinding stage if process is not stopped, cocoa butter and cocoa powder can be separated. Once the cocoa liquor is approved, it is mixed with other ingredients and warmed up, kneaded and continuously stirred to get the right texture. Then grinding is done to deliver the optimum fineness. After refining, the chocolate is conched for hours. The weeks spent in the rainforest meant unforgettable experiences, furthermore professional knowledge. Then I travelled to a chocolate laboratory near Paris. The days spent here had a tremendous impact on me, with the support of the world's most respected chocolatiers and experts. After professional discussions and reflections, I defined and drew the flavour profile of the chocolate. The chocolate taste that I already felt in my mouth, and I was looking forward to start one of the most exciting part of the work. I tasted many cocoa beans and chocolate liquors from different origins of the world, one after another, then a break, have some water and salty snacks, again some water, rest and then it started again. That is what I done all day long until chocoMe Délice dark chocolate recipe was created with the unique aroma profile. This chocolate recipe expresses what chocoMe represents: the search for absolute uniqueness and perfection. The main flavour description of our dark chocolate: convincing cocoa taste, dominant sourness, strong red fruity notes and lingering aftertaste. After my very own chocolate recipe was finalized, I started to imagine, work and experiment what a fantastic chocolate creation can be made of it. As a final process of creating such fine chocolate is the so-called tempering process, where crystal structure has to be made. The chocolate has to be shiny and crack as a straight line when braking. These results can be achieved by orientation the chocolate to certain temperature intervals, while continuous movement and time interval is needed to fulfil. The origins of our very own custom chocolate are Peru and Dominican Republic. Cocoa beans from Peru have fruity notes with pleasant acidity and slightly nutty flavours. Beans from Dominican Republic have a fruity aroma and only subtly spicy. 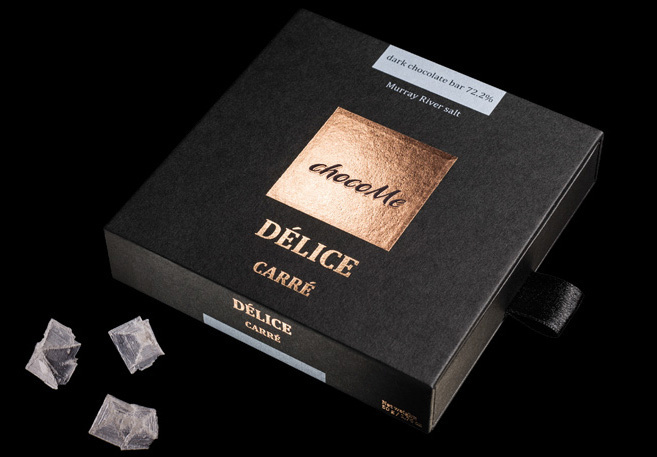 Blending of the before mentioned beans resulted the conceived recipe, which makes our chocoMe Délice chocolate incomparable. 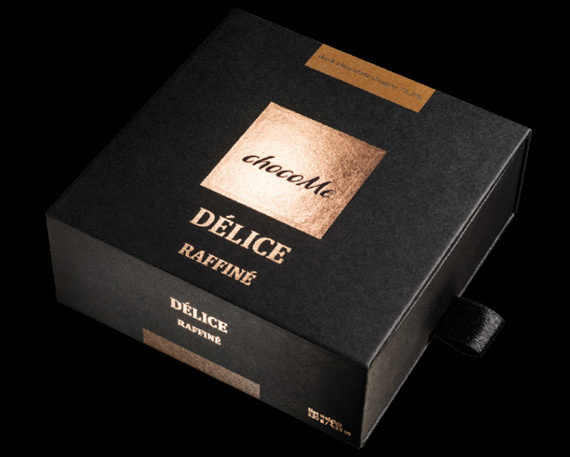 I truly believe if you have this beautifully packed chocolate in your hands, you take it home, unpack and taste it, I can introduce an unforgettable, exotic culinary experience for you.